The next step of evolution of Bing for Mobile is up with its release of the new Bing for Mobile app for iPhone and Android. Bing has announced that it is going to release the update very soon for other devices. The update is HTML5 to make the browsing experience simpler and to provide a consistent and a faster mobile search. It is applicable for m.bing.com from your browser or the Bing app. Bing says, in order to bring an advanced search, the engines need to be able to call functions that are currently ‘hiding’ in apps so it can better help people get done what they are trying to get done. This mobile update comprises camera support and voice search. • Maps/List Split View: Provides a dynamic way to synchronize a list such as business listings and directions and a map in a single view making it easy to see the location of what you’re searching for. Also works for driving directions and transit. • Transit/Real-Time: the Android app now features transit routing/real-time transit and news– all features that were previously only available on m.bing.com. 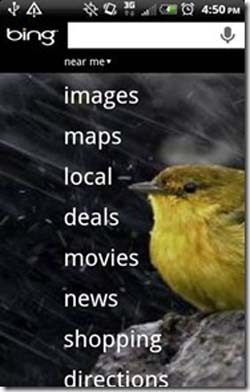 • Video Domain: launched last month on m.bing, the new video domain is now available on iPhone. 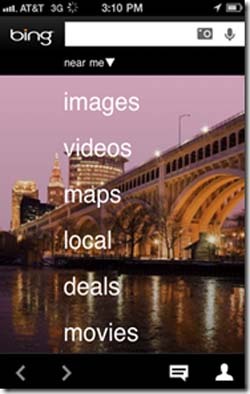 • Deals: One-stop deal shopping and convenient mobile phone access for local deals from more than 100 deal providers across the US.